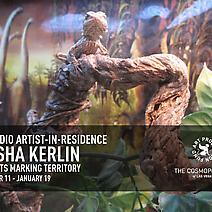 Alisha Kerlin is an artist who uses painting, sculpture, digital photography, writing and installation. Solitaire games, fallen trees, vultures, dismissive cats, tic tac toe, measuring tapes, dangling treats, lizards, birds, potatoes, traffic cones, and the carrot and stick idiom are examples of subject matter used within her artworks. Since 2005 her work has been exhibited throughout the United States, including one person shows in New York, Brooklyn, Long Island City, San Francisco, Boston, and Knoxville. Her work has been included in numerous group shows including “Greater New York” at PS1 MoMA, 2010. Interviews and reviews about Kerlin’s work can be found in publications such as Spike, Art Forum, New York Arts Magazine, and Art21.com. Kerlin received her BFA from the University of Tennessee, Knoxville and MFA from the Milton Avery School of Art, Bard College, New York. She recently moved to Las Vegas from NYC after teaching as the Artist in Residence, University of Nevada, Las Vegas, Spring 2012.